Buttons and Scruffy took their seats again. 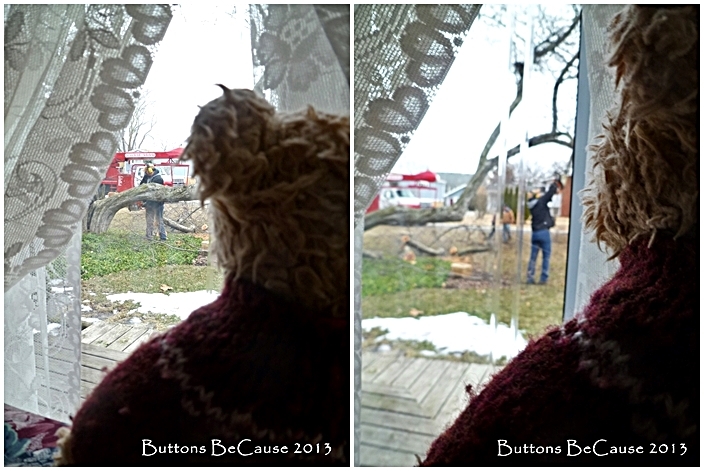 "They're here" cried Scruffy, as the big red trucks parked in front of the house. Both Scruffy and Buttons were feeling conflicted about the tree. How could they be excited and sad at the same time? As the man walked up to the old tree his chainsaw roared to life. Va-roommmm, putt putt. He raised the saw, and began to cut the tree down. He started to cut the tree down. The buzzing sound of the chainsaw filled the air as it ripped through the wood flesh of the doomed tree. "The last of the trees trunks. Bye-bye tree" said Buttons sadly. "Hey, he didn't yell Tim-bear!" said a disappointed Scruffy. "Come on Buttons, I've got an idea" said Scruffy. We're sorry to see the tree go, but we're excited to learn the rest of the adventure! What is it? What is it? We can't wait!